Intel's high-end Crystal Well, the Core i7-4770R, has remained out of reach for consumers despite being introduced back in June 2013. While Apple's notebooks use the mobile Crystal Well parts, the 2013 iMac restricts itself to the Core i5-4570R. Users wanting to stay out of the Apple ecosystem have been left in the cold. 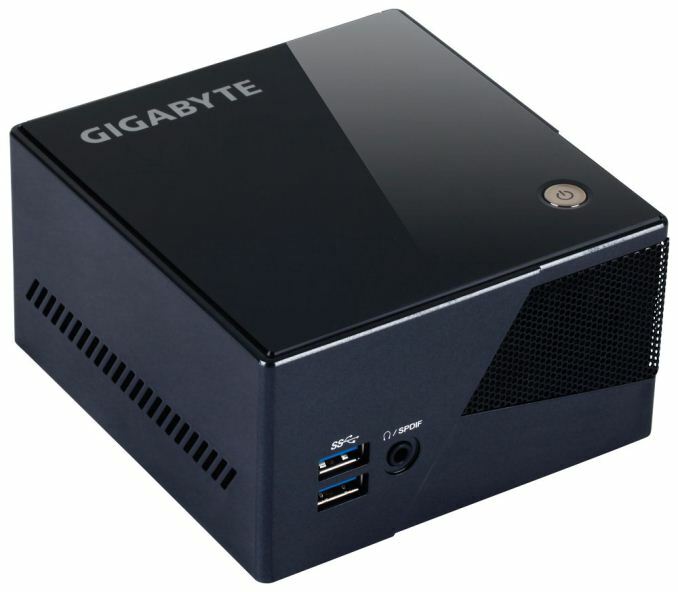 Gigabyte is coming to the rescue with the launch of the BRIX Pro in the NUC form factor. The BRIX Pro is a barebones desktop machine. We had looked at the various BRIX models before, and this model, while maintaining the length and width of the existing BRIX units, is equipped with the 65W TDP i7-4770R, and the unit comes in the NUC form factor! This means that the unit is really tiny. The length and width are almost the same as the other NUC form factor machines (as shown in the picture below). The BRIX Pro builds upon the BRIX s, which has support for a 2.5" drive. The height is still more than that of the BRIX s, in order to accommodate the thermal design for a 65W CPU. Our review unit landed last Friday. With CES this week, and limited time at our disposal, we decided to split the coverage of the BRIX Pro into two parts. In today's article, we will look at the performance of the CPU and GPU, as well as the thermal performance of the package along with some power consumption numbers. In the second part towards the end of the month, we plan to go into more detailed benchmarks and how to outfit the BRIX Pro to get a well rounded system. Since we wanted to get up and running quickly, the RAM and mSATA SSD were just transferred from the recently reviewed NUC kit to the BRIX Pro. In our second part of the review, we will evaluate the BRIX Pro with different SODIMMs / SSDs. For now, the benchmarks presented in the rest of this piece are based on the configuration below. I'm interested in CPU performance only. I need another quad core render node, but my office is cluttered as it is. I don't like to put systems on the floor and I don't have a spare 'server room'. "In the second part towards the end of the month...."